Some girls just can’t wait. Patrick O’Donnell, a Galway Irishman living in 19th-century Charleston, discovered this the hard way. According to local legend, in 1852 O’Donnell set about building a house for his fiancée. But his dream of an Italian Renaissance mansion was so ambitious that it took four years to realize. In the meantime, his bride-to-be—with other suitors knocking at her door—called off their engagement and married another. 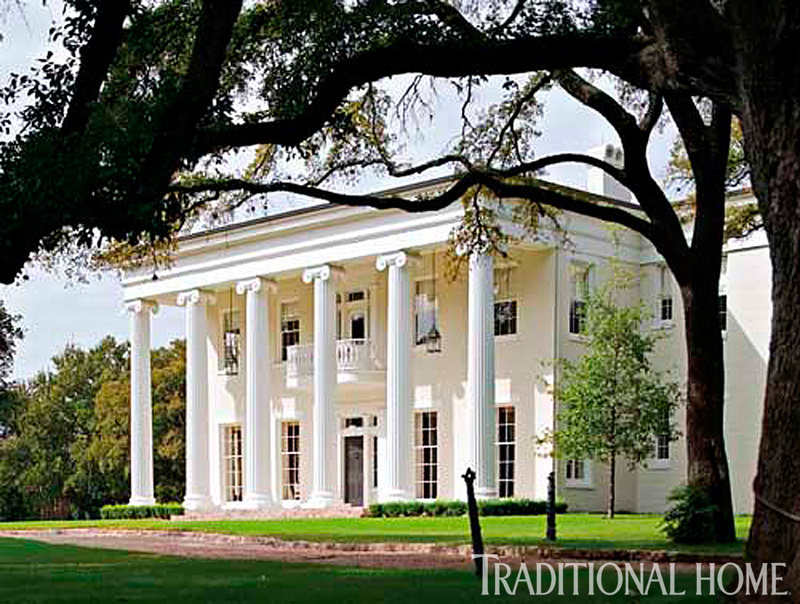 Wide verandas on the south side punctuated by elegant balustrades and Doric columns overlook a wading pool and open all three floors to the outdoors. 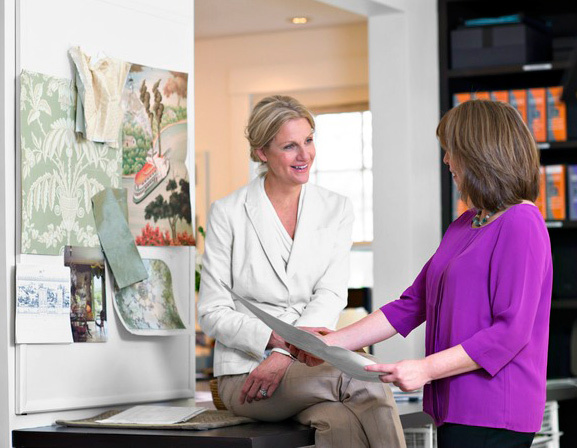 Interior designer: Susanne Lichten Csongor, SLC Interiors, 264 Bay Rd., South Hamilton, MA 01982; 978/468-4330, slcinteriors.com. 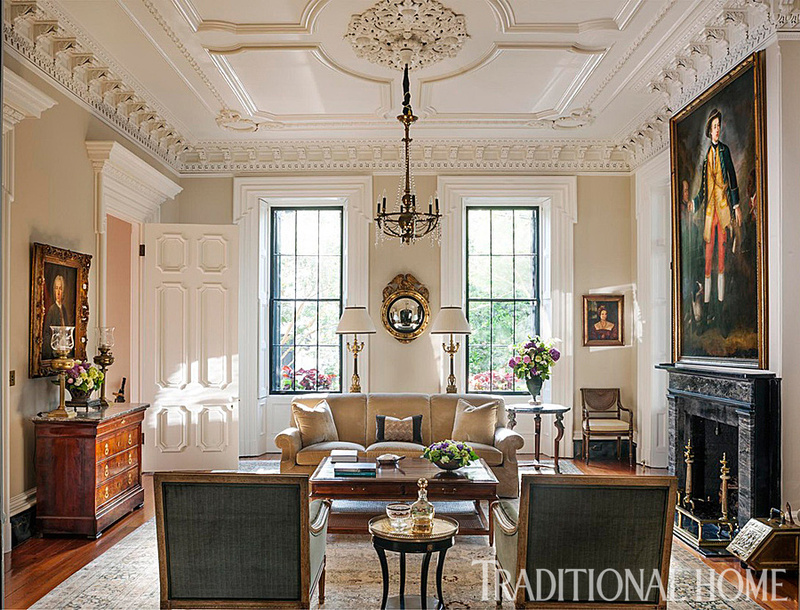 Csongor first beheld the wealth of the home’s architectural details—multistepped moldings, layer upon layer of ornate cornices, exuberant ceiling friezes, marble fireplaces—about three years ago. Longtime New England clients with whom she had collaborated on a dozen other projects had purchased the property as a vacation home four years earlier. But as the city developed a flourishing restaurant scene and the Charleston Food + Wine festival acquired an international reputation, these gourmands began spending more time in Charleston. 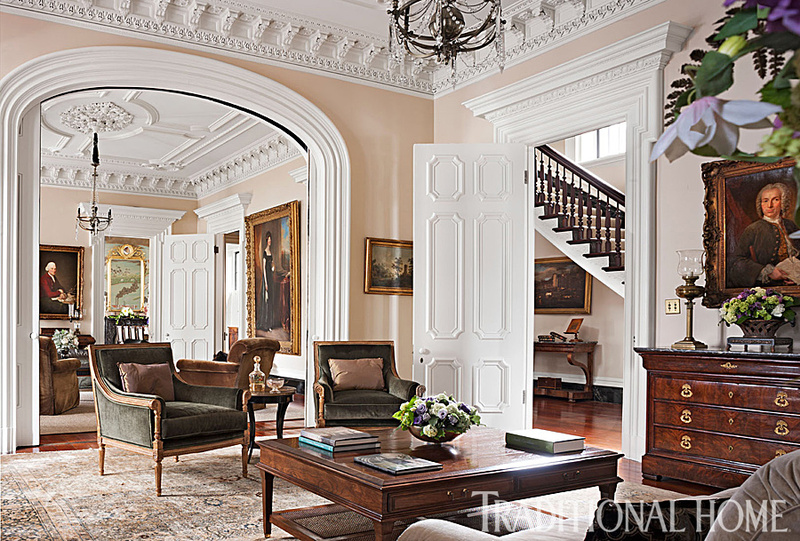 They called in Csongor to make the house feel less like a pied-à-terre and more like the grand manse O’Donnell had envisioned. An Empire-style chest of drawers under an 18th-century portrait by an understudy of French painter Louis Tocqué creates a handsome vignette in the drawing room. Sofa (custom): McLaughlin Upholstering, mclaughlinupholstering.com. Bolster pillow on sofa: Melissa Levinson Antiques, melissalevinson.com. Chest of drawers; portrait above chest of drawers; hurricanes on chest; stand and vase holding flowers on chest: Doyle New York, doylenewyork.com. 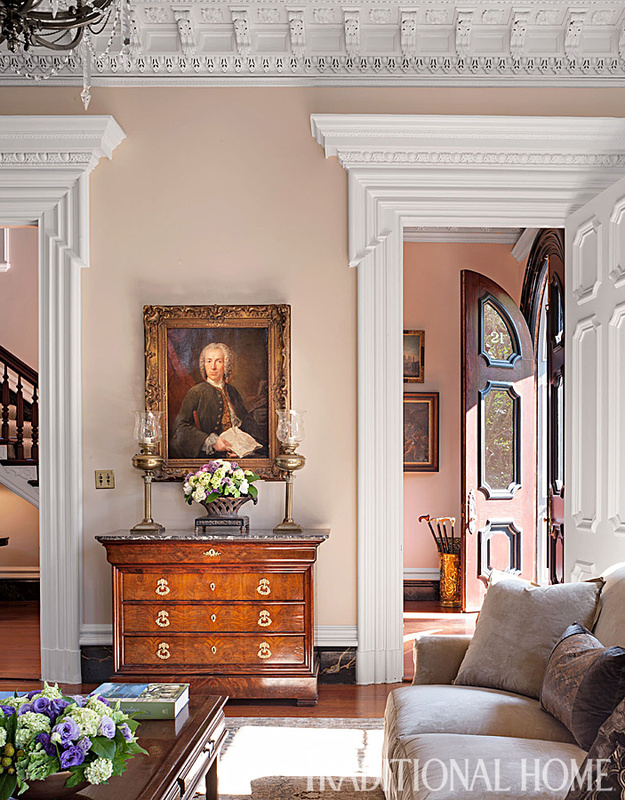 An antique Tabriz carpet from Doris Leslie Blau anchors the front half of a double-parlor drawing room, which gathers a custom scroll-arm sofa, a Rose Tarlow coffee table, and two Nancy Corzine “Rateau” chairs. To accomplish this, Csongor offset the magnificence of the architecture throughout the 9,700-square-foot main home with a neutral palette of mostly beige, gray, and white, along with a near-absence of patterned fabrics, a practiced restraint when it came to accessories, and natural materials such as linens and sisal carpets. She allowed herself “a little punch of elegance on pillows,” which feature antique brocades, needlepoint, and tasseled fringes. 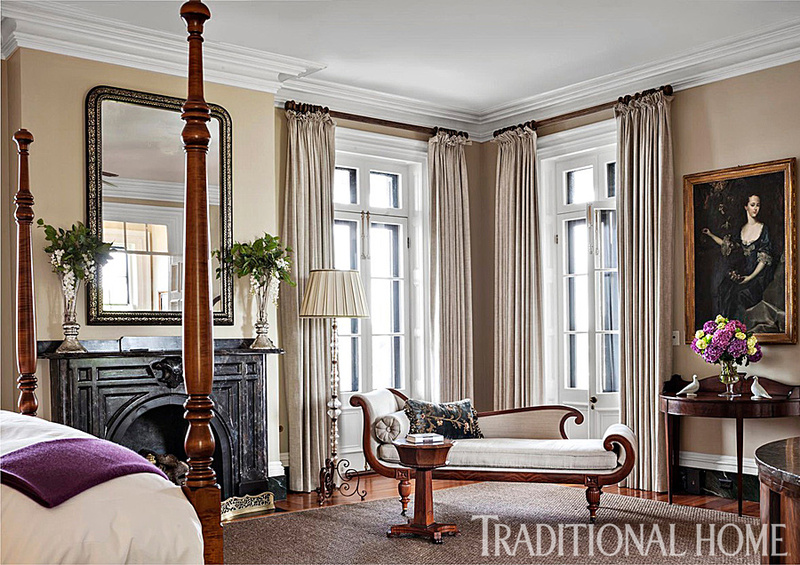 A view from the front parlor to the rear parlor, where a daybed from another of the clients’ homes, upholstered in a Clarence House silk, keeps company with a mid-19th-century Continental neoclassical console from Marie Antoinette Antiques and an 18th-century British portrait of Alexander, 4th Duke of Gordon. Pair of chairs (“Rateau Bergere” #2065): Nancy Corzine, nancycorzine.com. Chair fabric (“Upcountry”/Alligator #36287-007, velvet): Scalamandré, scalamandre.com. Table between chairs: owner’s collection. Coffee table (“Louis XVI Nightstand” #NS-2-156): Rose Tarlow-Melrose House, rosetarlow.com. Area rug (antique): Doris Leslie Blau, dorisleslieblau.com. Brown lounge chairs (custom); daybed (custom): McLaughlin Upholstering, mclaughlinupholstering.com. Lounge-chair fabric: Brunschwig & Fils, brunschwig.com. Daybed fabric (“Traviata”/Taupe #34321-2): Clarence House, clarencehouse.com. Coffee table (“Regent Cocktail Table” #4301-54): Nancy Corzine, nancycorzine.com. Floor lamps (“Tortoise Floor Lamp” #4107, Charles Pollock Collection): William Switzer, williamswitzer.com. Console table: Marie Antoinette French Antiques & Fine Furniture, 1stdibs.com. Lamps on console: David Skinner Antiques, davidskinnerantiques.com. Box on console: David Neligan Antiques, davidneliganantiques.com. Portrait above console: Doyle New York, doylenewyork.com. Patrick O’Donnell incorporated an existing structure into his house design; today that area is the kitchen. A small breakfast room contains the clients’ own corner cabinet and settee and spindle-back Windsor chairs from Debenham Antiques in England. Csongor worked with Bryan Reiss of Distinctive Designs in Mount Pleasant, South Carolina, on the design of cabinetry and an island that features locally sourced black marble. Charles Edwards Ashwell lanterns hang above. The grisaille harbor scene, purchased from Gracie, was made by an 18th-century French company. The Minton Spindell counter stools have Townsend Leather seats. Cabinetry (custom): Premier Custom-Built Inc., premiercb.com. Cabinetry design (Brian Reiss): Distinctive Design, distinctivedesignllc.com. Wall and cabinetry paint: custom-mixed. Cabinetry hardware (#523): Omnia Industries, omniaindustries.com. Bar stools (“Jacobean Counter Stools” #5900.28B): Minton- Spidell, minton-spidell.com. Bar-stool fabric: Townsend Leather, townsendleather.com. Hanging lights over island (“Ashwell Lanterns” #HL-310): Charles Edwards, charlesedwards.com. Hanging lights over stair area: Ann-Morris Antiques, ann-morris.com. Wolf range; copper range hood: existing. Rug runner (antique): Stark, starkcarpet.com. Framed scene (“Passage des Detroits” #NYS-PAS, Custom European and American Scenics Collection, Handpainted Wallpaper): Gracie, graciestudio.com. Carpet on stairs (“Paris”/Ebony): Stark, starkcarpet.com. Island sink (Professional Series, Stainless Steel #PSX1103010): Franke KSD, frankeksd.com. Island faucet (“Perrin & Rowe Bridge Kitchen Faucet with Sidespray “U.4756-2): Rohl, rohlhome.com. Corner cupboard; settee: owner’s collection. Pillow on settee (“Brompton”): Peter Fasano. peterfasano.com. Seat cushion on settee: Kerry Joyce, kerryjoyce.com. Dining table: Charles Spada Antiques, charlesspadaantiques.com. Dining chairs: Debenham Antiques Ltd., antiquefurniture.tv. 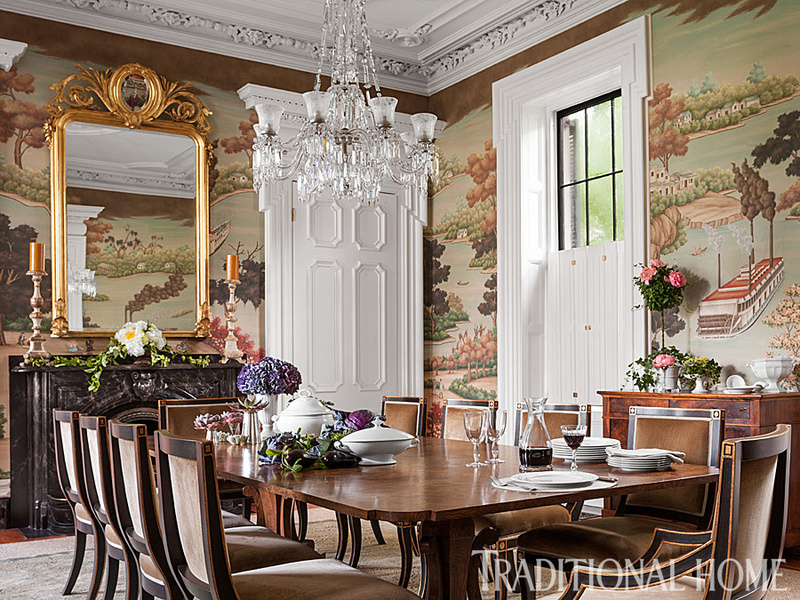 A custom Gracie wallpaper energizes the dining room where Nancy Corzine chairs surround a custom New Classics table. 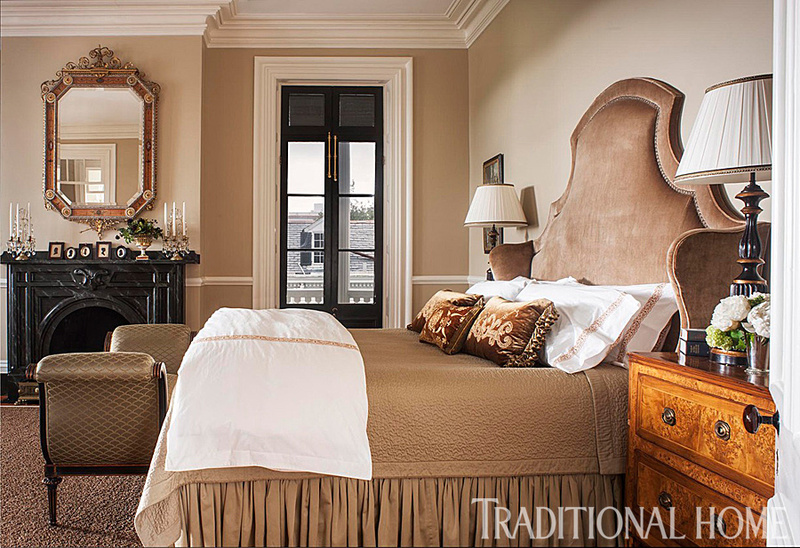 Above the marble fireplace is a Napoleon III mirror from East & Orient Company in Dallas. The crystal chandelier came with the home. Ceiling and trim paint: custom mixed. Area rug (“Agave Superior”/Quarry): Merida, meridameridian.com. Dining table (custom, “Regency Pedestal Table” #W1031): New Classics, newclassics.net. Dining chairs (“Directoire” #1040): Nancy Corzine, nancycorzine.com. Dining-chair fabric (“Traviata”/Tobacco #34321-7): Clarence House, clarencehouse.com. Mirror over mantel: East and Orient Co., eastandorient.com. Candlesticks on mantel: Dagmar Design, dagmardesign.com. Covered soup tureen; covered serving dish: Charles Spada Antiques, charlesspadaantiques.com. Vases on table: Andrew Spindler Antiques, spindlerantiques.com. Adjacent to the parlor, the powder room boasts a Verde marble sink with gilded swan faucet by P.E. Guerin. A 19th-century English portrait is visible in the reflection of a Louis XVI-style mirror from Trianon Antiques. The sconce is French 18th-century cast bronze. Wallcovering (“Palladio”/Yellow, Red #20214-05, discontinued): Cowtan & Tout, cowtan.com. Portrait: Doyle New York, doylenewyork.com. 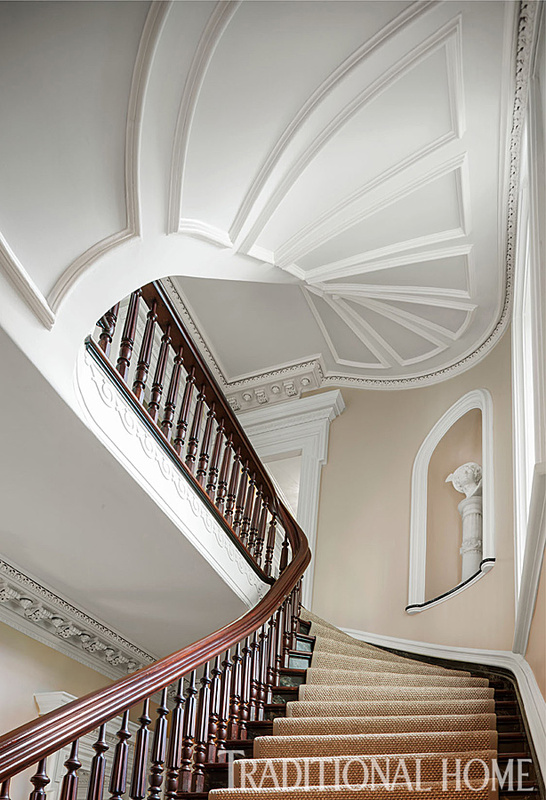 Deploying a natural Merida agave runner on the stair allowed the magnificent architecture to shine, including turned and fluted balusters, a coffin corner niche, and dramatically spiraling moldings overhead. Wall paint (“Sandcastle” #C2-366W): C2 Paint, c2paint.com. Carpet on stairs (“Agave Superior”/Quarry): Merida, meridameridian.com. A pair of tufted-leather wing chairs, circa 1930, evoke a British men’s club. 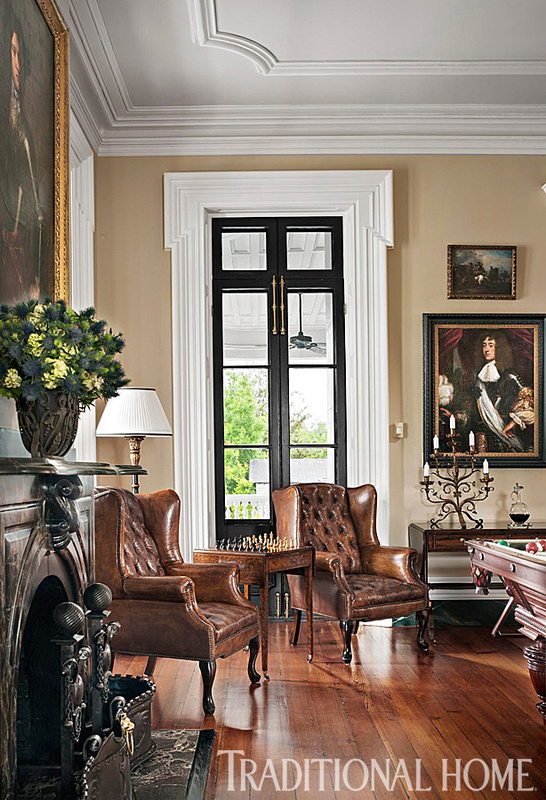 Leather chairs: Melissa Levinson Antiques, 1stdibs.com. Table between chairs: David Skinner Antiques, davidskinnerantiques.com. Candelabra on console; art over console; art over mantel: Doyle New York, doylenewyork.com. 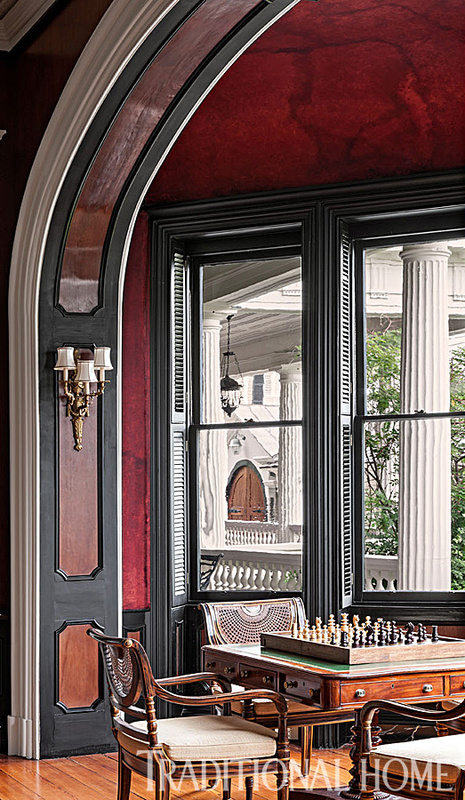 Billiard table (“Union League”): Blatt Billiards, blattbilliards.com. Andirons and fire skirt: Golden & Assoc. Antiques, goldenassociatesantiques.com. 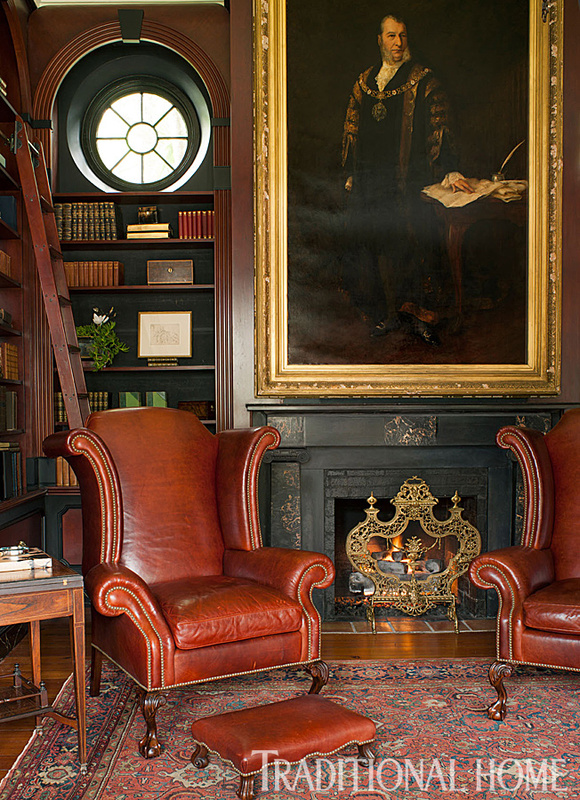 Leather chairs by the hearth are only fitting in this sophisticated library. 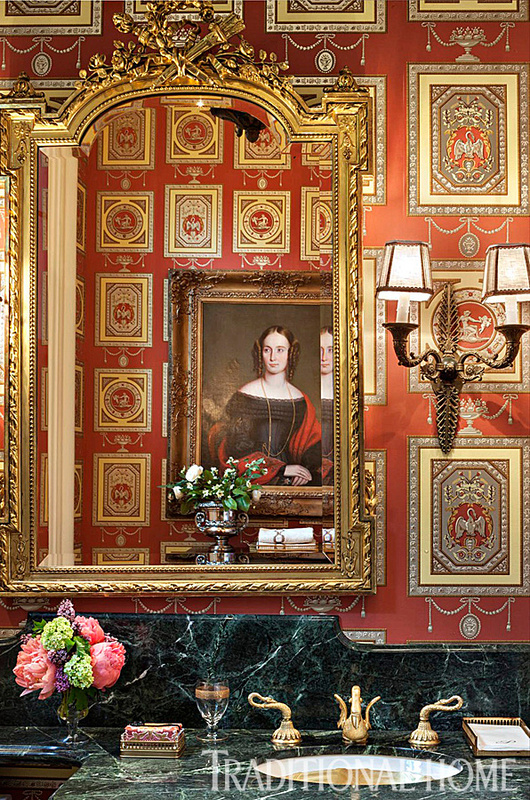 A large portrait above the fireplace continues the sense of history that flows throughout the house. 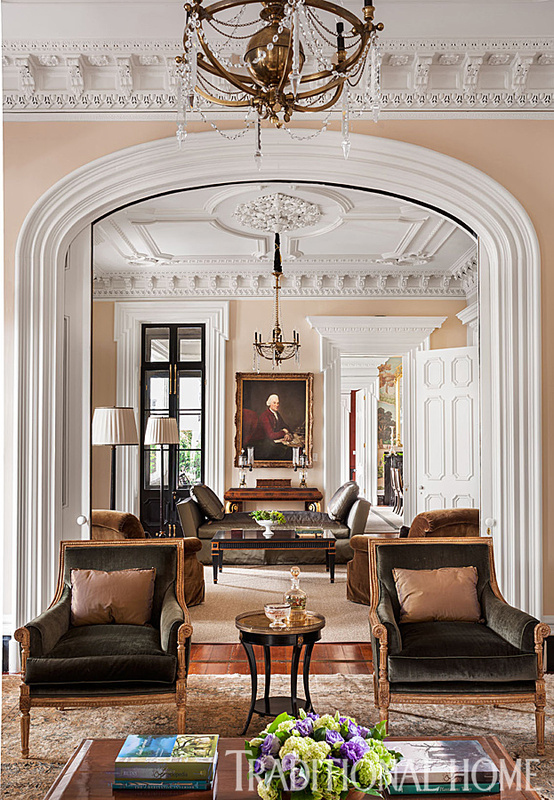 A rounded archway and classic Venetian plaster walls and ceiling frame English Regency cane-back armchairs purchased at Manhattan’s Doyle auction house. Wall treatment (faux painting): custom. Game table: Doyle New York, doylenewyork.com. Chairs at game table: antique. Chair-cushion fabric (#140715, by Sanderson, discontinued): Zoffany, zoffany.com. 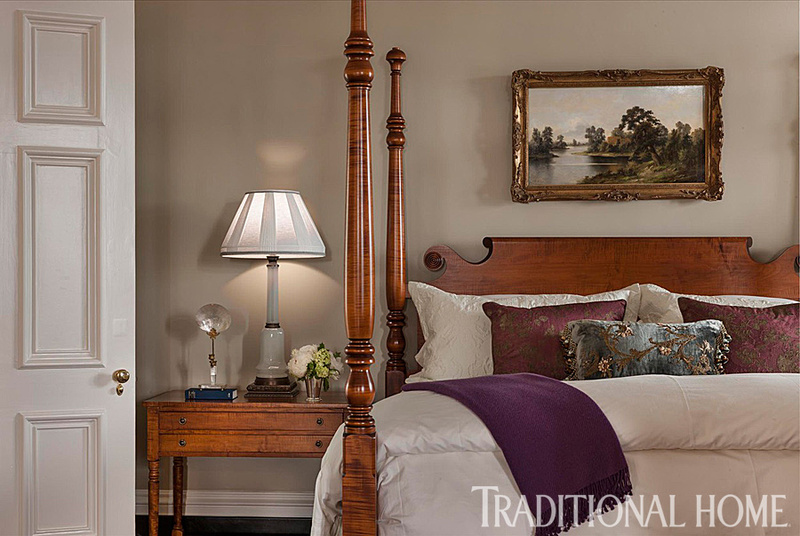 The master bed is a Leonards reproduction of an early 1800s sea captain’s bed discovered in Maine. It’s dressed in Sferra bedding and pillows made from vintage fabrics by Melissa Levinson Antiques. Bed (“Maine Sea Captain’s Tallpost Bed”): Leonards New England, leonardsantiques.com. Throw: ABC Carpet & Home, abchome.com. A circa 1825–35 mahogany recamier made in Boston in the Regency style, a faceted Continental sewing table from the 19th century, and an 18th-century portrait share the master bedroom with a Merida sisal carpet and linen curtains. Area rug (“Madagascar”/Ash): Merida, meridameridian.com. Chaise: James Sansum Fine & Decorative Art, jamessansum.com. Pillow on chaise: Melissa Levinson Antiques, 1stdibs.com. Table by chaise: Doyle New York, doylenewyork.com. Floor lamp: Trianon Antiques, trianonantiques.com. Demilune; art above demilune; birds on demilune: David Neligan Antiques, davidneliganantiques.com. Drapery (“Kala”/Oatmeal #J309F-03, by Jane Churchill, discontinued): Cowtan & Tout, cowtan.com. Drapery hardware (custom): Webster & Co., webstercompany.com. Mirror over mantel: Antique & Art Exchange, antiqueandartexchange.com. In a guest bedroom, for instance, a mantel displays framed silhouettes, which were all the rage in O’Donnell’s day. “I probably paid twenty dollars apiece for those,” Csongor notes. Of course, there are antiques and impressive 18th- and 19th-century paintings throughout the house that are in keeping with the husband’s desire for authenticity. However, Csongor juxtaposed them with new comfy upholstered furniture, understated fabrics, and plain painted walls. 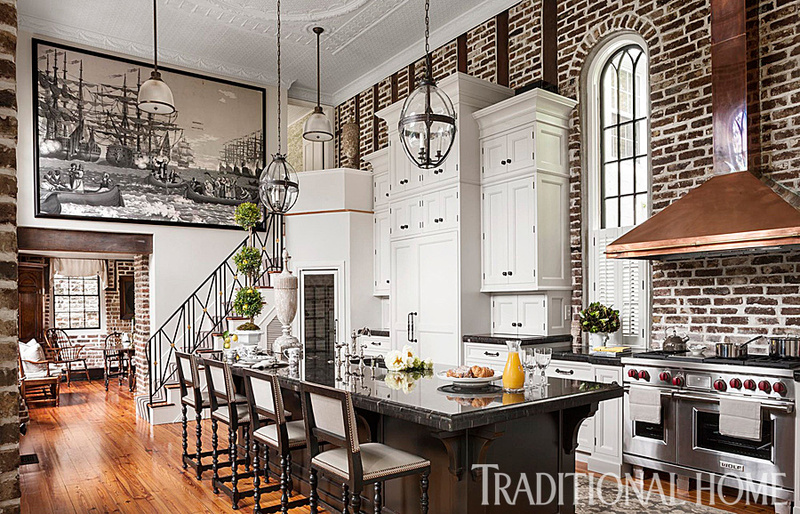 The contemporary expressions of traditional ideas make the residence much more serviceable for the homeowners, who often travel down with several couples at a time to enjoy the famous local cuisine and Southern charms of “Chucktown,” as the city has been nicknamed. Today the home’s seven bedrooms are frequently filled with guests, its double drawing room hosts large gatherings, and the dining room is the scene of candlelit dinners for 10. It breathes with a life that sadly eluded Patrick O’Donnell. What was once a “heartbreak house” has been transformed, thanks to Csongor and its homeowners, into a house of mirth. 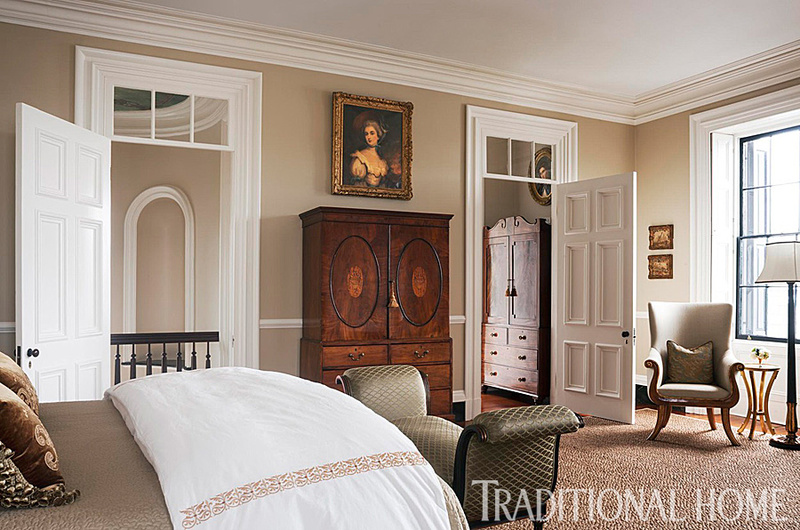 A different angle of the room shows two antique armoires and the beautiful, quiet palette. 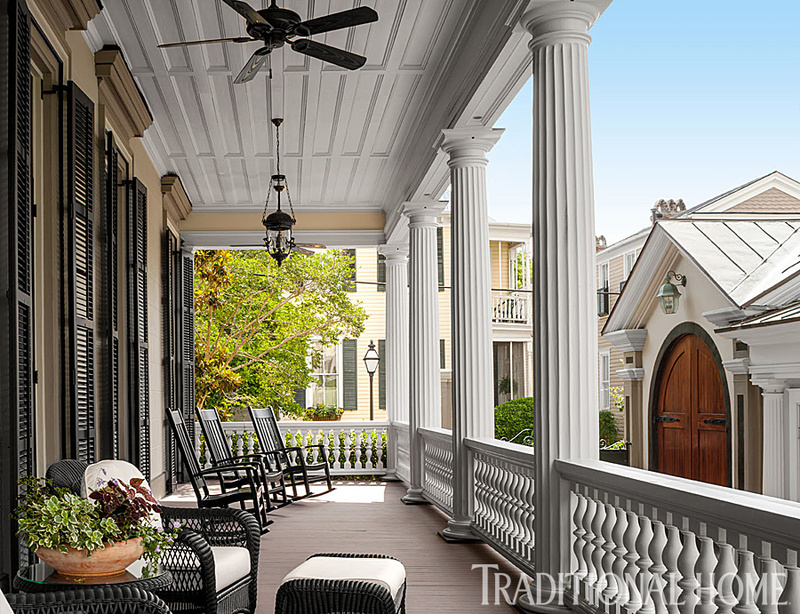 Deep porches that shield interiors from the sun are a classic feature of Southern architecture. This home’s carriage house is in the background. Rocking chairs (“Charleston Rocker”): New River Casual Furniture, newrivercasualfurniture.com. Rattan chair and ottoman (Charleston Collection): NorthCape International, northcapeinternational.com. 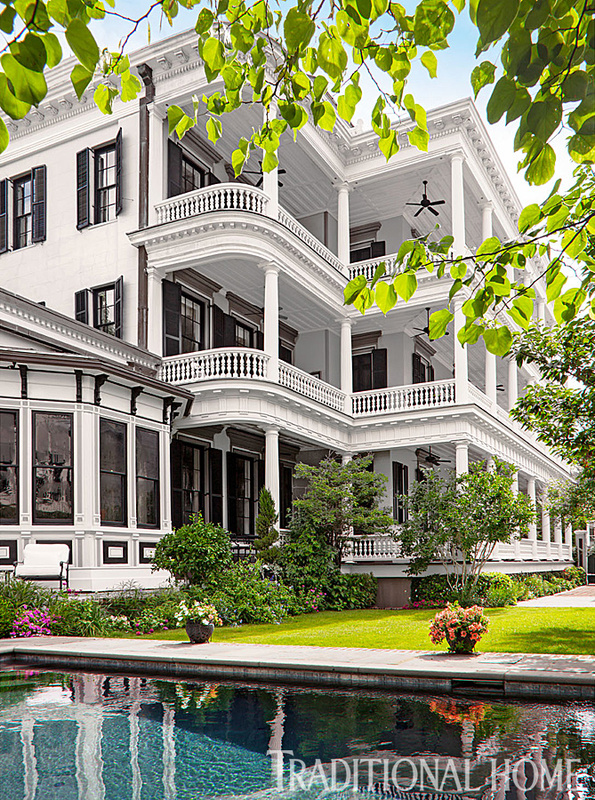 Take a tour of another grand, historic home!